Explanation: The small, northern constellation Triangulum harbors this magnificent face-on spiral galaxy, M33. Its popular names include the Pinwheel Galaxy or just the Triangulum Galaxy. M33 is over 50,000 light-years in diameter, third largest in the Local Group of galaxies after the Andromeda Galaxy (M31), and our own Milky Way. About 3 million light-years from the Milky Way, M33 is itself thought to be a satellite of the Andromeda Galaxy and astronomers in these two galaxies would likely have spectacular views of each other's grand spiral star systems. As for the view from planet Earth, this sharp image shows off M33's blue star clusters and pinkish star forming regions along the galaxy's loosely wound spiral arms. In fact, the cavernous NGC 604 is the brightest star forming region, seen here at about the 7 o'clock position from the galaxy center. Like M31, M33's population of well-measured variable stars have helped make this nearby spiral a cosmic yardstick for establishing the distance scale of the Universe. In my amateur opinion, not a lot of Hα has been used for this image, if any at all. It could be a pure RGB+L image, where none of the colors have been "exaggerated". This gives us an excellent opportunity to judge the overall colors and perhaps also the "true brightness" of the different parts of this galaxy. We can immediately see that there are two really bright pink regions of star formation in this galaxy, one of which, NGC 604, is really particularly bright. We can also see that the central region, while yellowish, is not strikingly yellow and not very bright. We can also see that there appears to be a small and relatively faint core somewhere in the central region (I wouldn't call it a bulge). We can see that there is an intermediate population in the inter-arm regions which is neither really yellowish nor really blue. And there are numerous bright blue arms in the arms, stars that stand out so clearly that we could probably count them all if we wanted to. Indeed, this picture is so sharp that we can almost count the stars everywhere except in the yellowish center. Using a couple of the links, it would appear M31 and M33 are only about 500k lyrs apart. Is that about right? If so, what a view! From looking at too many astroimages for too many years, I can confidently say this is LRGB. Without Ha, you get a better sense of the stellar part of this galaxy. I should also like to mention that many of its HII regions also exhibit OIII emission but this is very rarely if never taken by amateurs for galaxies. Professionals with OIII combined with really distant active galaxies, well that's a whole other picture (pun intended)! From looking at too many astroimages for too many years, I can confidently say this is LRGB. Just RGB. It was shot with a DSLR, so there's no L channel. For some reason both M101 and M33 are called the Pinwheel Galaxy, I've always used it to refer to M101. 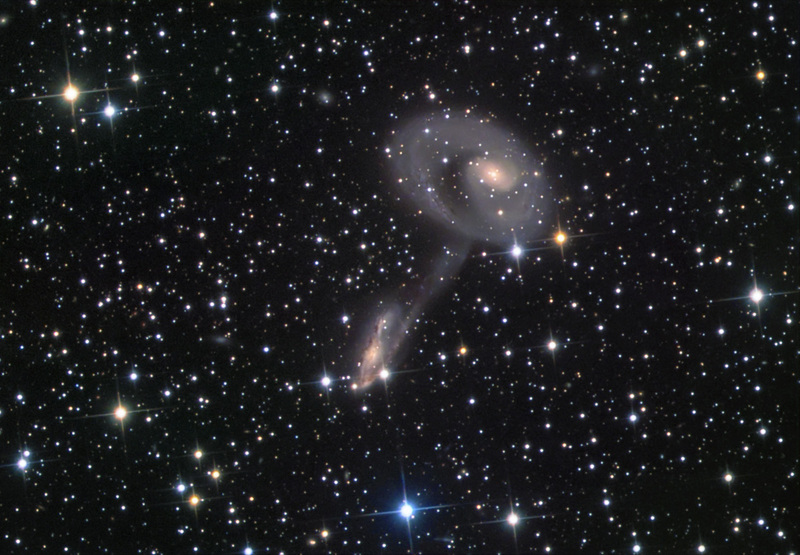 The Box Nebula refers to both NGC 6309 and NGC 6445 but I don't know which is the "real" one. You also get both IC 1318 and NGC 6302 being called the Butterfly Nebula. Just like NGC 55 and NGC 4631 are both called the Whale galaxy. NGC 604 is relatively easy visually with a modest scope (e.g., 12” or 30.5 cm aperture) on a good night. I have never heard NGC 55 called the Whale Galaxy? I do know that somewhere there is a Sacred Mushroom Galaxy. I just love astronomical names. NGC 55, also occasionally referred to as The Whale Galaxy, is a Magellanic type barred spiral galaxy located about 7 million light-years away in the constellation Sculptor. ESO 138-IG29, The Sacred Mushroom Galaxy. Photo: Josef Pöpsel, Capella Observatory.